In what at first appeared to be a harmless political stunt, Erie County Executive Mark C. Poloncarz ventured over to the Broadway Market to pardon a butter lamb today. For some community leaders in touch with their Christian faiths, it wasn’t so harmless after all. The first reaction a reasonable person might have might be, “lighten up, Francis”. The second reaction might be to pose a question. If the lump of butter molded into a lamb shape and sold in a box is such a holy portrayal of Jesus, why are we cutting it with a knife and eating it? Are we all Romans, symbolically sacrificing a dairy portrayal of the Messiah? It was a joke – a marketing stunt. It was an effort to promote Buffalo, the Broadway Market, our Easter traditions, Polish heritage, and the company that makes the butter lamb. Google it, and you’ll notice that the stunt worked – it was picked up as a “weird news” story on the AP wire, and ABC, MSN, Fox, the Times of Malta, and the Washington Post all ran the story. Poloncarz didn’t just pardon any old lamb, but one manufactured by the Malczewski company, which gleefully promoted the Poloncarz pardon on its Facebook page. How does the “Catholic insider” jibe his offense with Exodus 20:4 – 6? Maybe don’t be so offended. He wasn’t really pardoning anything, and the butter lamb isn’t Jesus. I consider the TED series of lectures a candidate for the “Highest and Best Use of the Internet” award, the greatest realization of the Information Revolution’s potential to inspire and educate. I reference TED semi-regularly (note: Buffalo’s own TEDx experience is coming in October), and please allow me to do so again to set the stage for our discussion. There is a lot we could pull out of those 18 minutes, but let me narrow the field to work through what I consider the freshest idea presented: the morality of Purity. Jonathan Haidt lays out five pillars of morality: Harm/Care, Fairness/Reciprocity, In-group Loyalty, Authority/Respect, and Purity/Sanctity. Conservatives value all five fairly equally, Liberals put far greater emphasis on the first two. But conservatives and liberals alike, and the moderates in between, all put some weight on Purity. As Haidt describes, Purity is one of the five moral pillars we are born with, pre-programmed to recognize and value. Haidt notes that while conservatives tend to follow a more traditional religious sense of Purity, the Liberal Purity path exists, is growing and has a new object of its affection: food. I don’t mean to definitively link Foodie-ism and Liberalism in any sort of causal or predictive relationship, though the demographics of both (white, wealthy, urban-focused) certainly coincide. Nor is this a fact-based argument about the actual merits of tying Foodie-ism to Progressive thought – its hard to extol the virtues of your electric car with a straight face when you dine on foie gras shipped in from half-way around the world (but more on that later). Instead, let’s talk about the moral feelings that drive the wildly different ways a segment of our culture focuses on food – local, organic, sustainable, free-trade, heritage and quality worthy of Foodieville restaurants hardly all have to mean the same thing (why is free-trade coffee more likely to soothe the Foodie’s discerning palate? ), though they are often mistakenly intertwined in the mind of the slumbering general public. As Haidt alludes, food isn’t really the point. The morality of purity lying behind the food is really about focusing on what one puts into one’s body, the cleanliness of the lifestyle. The sacredness is found in the purity of the food, but that purity can be found other ways. To extrapolate, the point is finding sanctity in a secularized, post-religious culture in order to fulfill the human need for Purity. Astrophysicist, atheist and NPR contributor Adam Frank recently addressed this topic when he sought to commandeer the word “sacred” to describe any awe-inspiring experience. Noting that it should be all but impossible to be Spiritual and Scientific, he was still at a loss to explain the feeling he gets when walking into a church, or (I assume) looking into space. Purity is still a moral pillar for the atheist scientist, and a little word twisting secularizes an ancient term for an experience that his deliberate conscious brain has rejected but pre-programmed mind still craves. How else do we secularize the sacred in our modern world to fulfill this basic human need? Finding the most pure lifestyle choice is a trend in modern life. Christopher McCandless read enough Tolstoy and Emerson to seek to purify his spirit in the wild. He walked into it, but never walked out, starving to death in an abandoned bus in Alaska, joining a long list of wilderness-philes who literally disappeared into the sanctity of nature. The urban/suburban debate often is imbued with a moral overtone that overwhelms any rational fact-based comparison of the sustainability/lifestyle merits of either living arrangement. Melissa Coleman recently wrote a memoir about growing up on a 1970’s Maine hippie commune where the adults attempted to divide their lives into three: one third of their time farming and doing manual labor, one third on family and child rearing, one third on reading and study. It imploded like many other such experiments at that time, but at its heart it resembles Elbert Hubbard’s “Head | Heart | Hands” mantra with the Roycrofters in East Aurora nearly a century earlier. Gene Rossellini moved to the wilds of western Canada for twenty years to try to teach himself to re-enter the Stone Age (he ultimately gave up and went home). Even exercise routines are overcome by quests for purity: the simple act of escaping from the doldrums of daily life is no longer enough. Now runners want shoes that are leaner, five fingered, or not present at all, and gym buffs lift rocks instead of traditional weights. They are called Caveman routines, and they have Paleo diets to go with them. And they are everywhere. My maternal grandmother is an Albrecht. For over half a century (and well into the 1970’s), the E.J. Albrect and Sons Poultry (or, “the chicken stand,” as it was known in my family) was a fixture on the south end of the Broadway Market. Our family was proud of the work, but also sought to evolve past raising and slaughtering chickens in the backyard. It was seen as progress to separate the home and cultivation of food. How far has the industrialization of food gone, how disconnected are we from the glossy, neatly rowed identical white breasts in the convenient jumbo pack that urban chicken coops became a general cause célèbre? And does it matter if the actual sacredness is often a false veneer? The food itself may be pure, but the process to make it so hardly aligns with Liberal principles. Organic farming reduces crop yields in a hungry world. Studies have found local food can have a higher carbon footprint than economically mass-produced varieties. The search for sacredness and purity among the religious and those on the right (often the same thing in the United States) is hardly rational; at its core it is a fulfillment of prejudicial pre-determined biases and needs. Why should secular and left-leaning attainments of purity be any more consistent or logical? Is there a more beloved Easter tradition in Buffalo then a visit to The Broadway Market? Shopping at the market for butter lambs, sausage, pierogi, rye bread and all sorts of ethnic Easter delicacies is as part of Easter weekend in Buffalo as the Easter Bunny himself. Over the years, the lovely and talented Christina Abt has led our coverage of this Buffalo institution with videos, live radio spots, newspaper columns and her extensive enterprise feature here at WNYM, “Market At The Crossroads“. Like Christina, we believe that The Broadway Market is central to our identity as Buffalonians and is a very special part of our past, present and future. If you love living in Buffalo and WNY and celebrate the region for what it is and not what we wish it to be, these videos originally filmed in 2007, are for you. In the first video, Christina tours Buffalo’s historic Broadway Market during the peak of the bustling Easter season. In her unique style, Christina explores what makes the Broadway Market such a vital component of the rich cultural tapestry of Buffalo and Western New York. In the second video, Christina explores the reasons many people come to the market each season, the family history that brings people back and touches on ways to keep the market busy throughout the year. In the third video, Christina interviews the matriarch of The Broadway Market and the creator of the butter lamb, Dorothy Malczewski. Dorothy is a special part of our local history, a wonderful woman with a love for her city. If you haven’t yet read any of Christina’s series on The Broadway Market, please click here and take the time to enjoy her enlightening work. From all of us at WNYMedia to you and your family, we wish you a very Happy Easter…or as they say at The Broadway Market, Wesołego Alleluja! Back in 2007, we did a series of videos on the history of Buffalo’s beloved Broadway Market and discussed the current state and the possibilities for sustainability and growth of this local cultural landmark. As our audience has evolved over the past two years, I wanted to post those videos again. It would appear that this was a tremendously successful Easter season at The Broadway Market and with new leadership, there are plans to make the market a year round regional destination once again. I was especially impressed with the events that expanded attendance during the holiday season. If you haven’t seen the video we shot of the “Peep-Off“, you’re missing out. Congratulations to all those involved with making Easter at The Market a special memory for hundreds of thousands of visitors and I hope that things continue to move forward positively. Anyhow, here are the videos featuring local author, blogger, radio host and all-around fantastic person Christina Abt of Buffalo Style. In her unique style, Christina explores what makes the Broadway Market such a vital component of the rich cultural tapestry of Buffalo and Western New York. In the final chapter of the series, Christina interviews the matriarch of The Broadway Market, Dorothy Malczewski. Dorothy is Buffalo…the kind of Buffalo that I want to live in and the kind of Buffalo that I want to maintain. It’s the Broadway Market that should be called something else. Hm, let’s see. How about “obsolete political pander where Buffalonians’ money goes to die.” Yeah, that’ll work. In the meantime we can hope for a real “public” market on the waterfront that people actually want to go to. Do Buffalonians cling to past glories for far too long, against all reason and hope? Really, is it the Broadway Market that people pine for, or is it the notion of a well-attended public market where the community came to shop & mingle many years ago? It’s not the building that matters – it’s what happens in it, as far as this particular example is concerned. What difference does it make where the market is, as long as people go regularly? If nostalgia was a money-making industry, Buffalo would be wealthier than Beverly Hills or Scarsdale. There is a way to make the Broadway Market an attractive year-round shopping mecca, but unfortunately the disgraced outgoing board pretty much went out of its way to ruin almost every good idea to come along. Now that they’re out, and now that someone is going to have to come in and fix the mess, the disgraced do-nothing board is (out of spite? out of stupidity?) auctioning off treasured items that are part and parcel of what little drawing power the Market has/d. “This is your chance to own a piece of Buffalo’s history, everything from the historic Broadway Market signs to the Easter Bunny hut will be sold,” said Cash Cunningham, who runs the Buffalo-based auction and real estate development company. It’s akin to a kid on your block being a jerk and taking his ball and going home, so no one else can enjoy it. BFA recommends you contact City Hall if you’re outraged, too. The Broadway Market is a city treasure, filled with history and loaded with potential. Unfortunately, it’s under-utilized, losing money, keeps bad hours, and is really, truly ugly. We know it has potential because of the Eastertime rush. We know it has potential because of its history, and people’s nostalgia for it. That potential is tempered by the decline of its surroundings over the past decades. If I had all the money in the world, I’d rip it down and build a brand-new structure as a destination for the area. After all, if Canal Side can all of a sudden draw people to a once-blighted and benighted parking lot under the Skyway, then a gleaming, modern Broadway Market could help draw people to Broadway-Fillmore. Of course, I hardly have enough money to fill up a tank of gas now, and I doubt that there’s political will or financial sense to be made of constructing a gleaming, modern marketplace on that site. I think what’s happening is that the market’s potential is being stunted by a whole host of issues. Let’s simplify. What if we abandoned the building completely? What if, instead, we set up something like what’s shown below on the site of the former K-Mart across the street? Make the cost of entry for vendors de minimis, and soon you’ll have a thriving, grassroots market. Tell farmers from other areas to market their wares there. Abolish restrictions on the use of the market. If it can be proven that people will use the market outside of Eastertime, then a push can be made to build a new enclosed market across the street. Just a thought, anyway. Being open on Sunday, when the refugees from the old neighborhood go to church, would help, too. The problem, Byrd says, is lack of vision. He took a position on the board because he imagined that it could be a part of the larger effor to revitalize Buffalo’s old Polonia dsitrict, which revolves around fixtures like the Central Terminal, St. Stanislaus, Corpus Christi, and the Adam Mickiewicz Library. This year Byrd was voted in as president of the board by a bloc of similarly minded progressives, offering a glimmer of hope for those who hoped to change the way business is done at the market. But the current board leadership managed to retain power by invalidating the vote that won Byrd the presidency, through a series of shenanigans that included ousting one board member on a technicality and fetching a compliant former board member from a nursing home to take his place, in order to make a quorum. In the aftermath, Byrd resigned; the old leadership returned and booted reform-minded board members Marty Biniasz and Father Anzelm Chalupka of Corpus Christi Church for missing too many meetings, which are held at 8:30 in the mornings on weekdays—tough to make for working professionals. For all the complaints about lack of public money, the current management practically threw away $1.2 million from Congresswoman Louise Slaughter in 2006. Slaughter, who was instrumental in the successful rejuvenation of Rochester’s public marketplace, earmarked the money for a public kitchen and a variety of much-needed infrastructure improvements. But Fronczak and the board conspired to use $1 million of Slaughter’s earmark to lure in a new tenant who proposed to open a factory outlet selling discount clothing—not at all in line with Slaughter’s vision of the market as a hub for community development and a source of healthy food in a multicultural neighborhood. Slaughter took her money off the table and walked away, disgusted, vowing never to help the market while Fronczak was still there. More recently, when the departure of KeyBank left the market with nagging vacancy and a loss of $6,000 per month in rent, Fronczak and the board courted a check-cashing operation based in New York City. Maybe check-cashing is a sevice the neighborhood needs, says Dobosiewicz, but it hardly burnishes the market’s already downtrodden image. “This is the plan there: Get whoever you can who will pay rent, don’t worry about who they are and how they fit in with the market,” he says. The current board has been less than receptive to new marketing ideas; they only halfheartedly went along with a Christmas market event last year, for example, which turned out to be hugely successful. Tenants who suggested a Fourth of July promotion were told it was bad idea. Why? Because it had never been done before. And management seems unwilling to accept the conclusions of customer surveys that indicate the market would attract more business if it stayed open past five o.clock on weekdays and instituted Sunday hours. Sandy Starks is a founding member of Western New York’s convivium of the Slow Food movement and a career professional in the food and wine industry. She was one of the organizers of the Christmas market, an effort in which she received so little cooperation from the market’s management that it wound up costing her money. She’s one of a number of Broadway Market enthusiasts who are waiting in the sidelines to contribute their ideas and expertise to the rebirth of the market. Starks imagines organic vegetable stands, high-quality coffee, good cheeses, and microbrews to draw in customer with expensive tatses; she imagines reaching out to potential new vendors in the Fillmore District’s burgeoning Vietnamese and Muslim communities, as well as a consistent effort to include the district’s majority African-American population in the market’s cultural history and governance, which have been an island of Eastern European whiteness in a neighborhood that is predominantly African American. Starks imagines events every weekend, promoted not only by individual participants but by the market’s management. Starks, Byrd, and Dobosiewicz point to the Clinton-Bailey market—in an equally distressed neighborhood, even further removed from downtown—as an indication of that the Broadway can succeed. WNYMedia.net was a proud sponsor of the first ever Broadway Market Christmas Food Fair along with BSC Group, CityView Properties, and David Tiftickjian & Sons. This weekend marks the start of a new tradition at The Broadway Market as the new Board of Directors looks to establish the market as a year round destination. 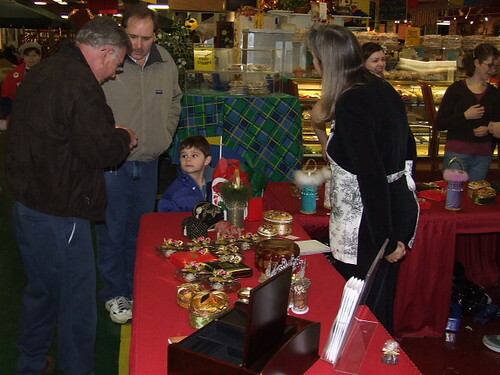 The Christmas Fair featured independent vendors as well as tried and true market favorites like Melanie’s Sweets and Malczewski Poultry. Santa Claus was on hand to visit with the children, the Community Music School provided music and the sounds of The Snowbelters Barber Shop Quartet filled the air. It was refreshing to see so many people at the market this weekend and the vendors were exceptionally pleased with the turnout. A great weekend for the market! If you weren’t able to attend this weekend’s festivities, be sure to make your reservations for Sandy Starks’ “Savor The Flavor” Wigilia Edition on December 8th and 15th. She’ll be sharing the making of a traditional Polish Christmas Eve dinner. Wigilia foods, including mushroom soup, pierogi, seafood and the traditional Christmas wafers (oplatek). Fr. Anzelm Chalupka, Pastor of Corpus Christi Church, will join Ms. Starks in explaining the Christmas Eve meal and will bless the Christmas wafers. This special Savor the Flavor presentation is expected to sell out quickly. For further information or to make a reservation, call Your Buffalo Tours at 716.839.5150 or order tickets online at Brown Paper Tickets.